It took me a bit longer than I thought getting to this blog post (errr, 8 months to be exact as I type with Penelope asleep on top of me). So 8 months ago, with a house full of cute baby clothes and endless items for baby feeding, caring and cleaning, a wardrobe that doesn’t fit and zero sleep, I latched on to a few cozy and luxurious items that made me feel at home and like me in my new role. 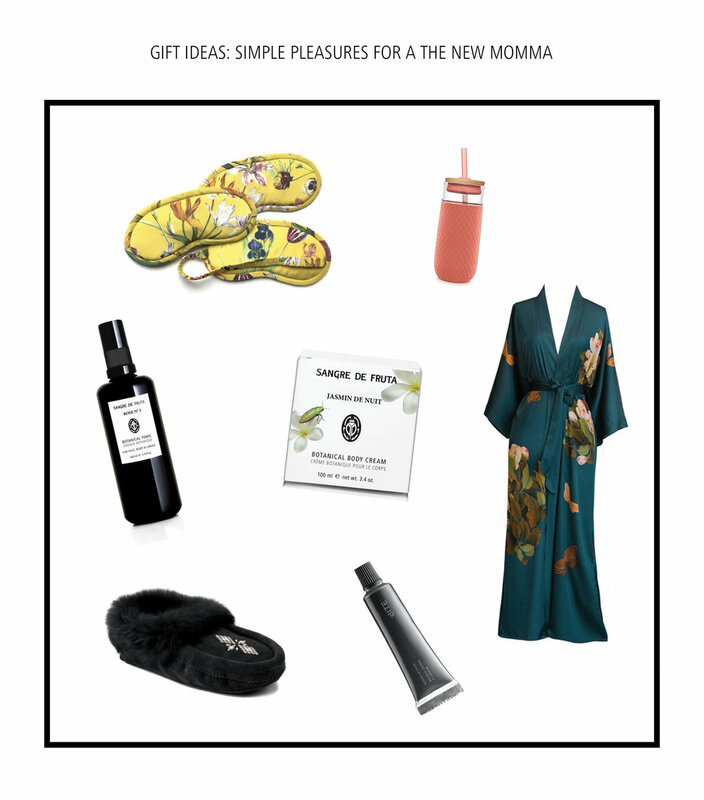 So this is the gift list for those shopping for the new mom in your life who already has the practical baby stuff and could use a treat that is just for her. Slip-on slippers : Cozy ones that can be stepped into without having to lean down (for when baby is in arms). These moccasin slippers from Manitobah Mukluks are so so warm and soft and it’s an Indigenous-owned company here in Canada. A silky sleep mask : For those much needed naps during the day. Spray it with a Lavender or Rose spray for relaxation and an escape into deep sleep. (Our Lavender by the Sea and Rose No.1 Tonics are perfect for this.) Strathcona makes the most beautiful masks with original hand made printed silks. A soft and silky or a cozy robe : A wraparound robe is breastfeeding friendly and can be taken on and off with one arm if baby is snoozing in arms. Also nice to have a presentable robe for when visitors turn up mid-nap! Open the Kimono makes chic washable robes and Paper Label Sleep makes cozy ones that double as a long sweater that can be worn to nip to the store. A huge glass water bottle with a glass straw : One-handed drinking for that intense need to hydrate! Ello makes one that is all of these things. A nice lip balm : Bite makes a lip therapy that is so natural it’s edible, and it tastes amazing. Dehydration is a thing while breastfeeding and a nice lip balm is one of those simple pleasures. Jasmin de Nuit Botanical Body Cream : After using unscented products all throughout pregnancy, gentle natural scents can be such a treat postpartum. Additionally this body cream is baby-safe and Jasmine and Sandalwood are known to be helpful for stretch marks.